Zen Herbal Liniment Spray contains clinically researched and effective natural herbal medicines to get you moving and active again. It is a fast and soothing liniment used in Traditional Chinese Medicine to provide joint and muscle care to relieve inflammation and pain. 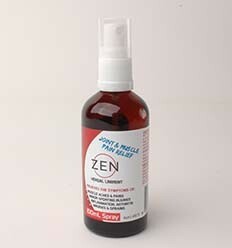 Zen Herbal Liniment Spray may help to relieve the symptoms of arthritis, rheumatism, minor sporting injuries, fractures, dislocations, bruises, sprains and musche spasms.